"Not a good week for Atlanta Airport with musical instruments," Masciadri wrote. "The only thing common is TSA itself. In my case they failed to put the restraining belt on the neck of the bass after inspection." Masciadri was on his way to Arkansas to give a recital, said The Strad, which also reported that the broken neck will cost $8,000 to repair, and that will take three months, during which he will have to borrow an instrument for performances including an appearance at Carnegie Hall. The good news (if anything about this can possibly be good) is that though the body and scroll were original, the neck was from 1913, he told The Strad. In response to Masciadri's post, Fenner reported on Facebook that, in regard to the incident last week, "it's been confirmed to me by the airline that it was Southwest themselves and they have taken full responsibility for the accident." What is the most damaging or potentially damaging situation you've faced, flying with an instrument? 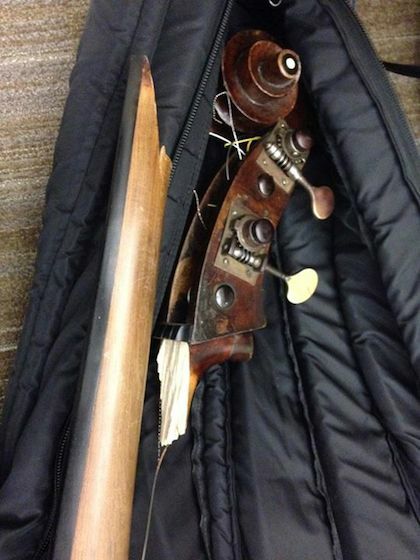 My goodness, I hope the bass wasn't traveling by air in a soft case, as the photo suggests.